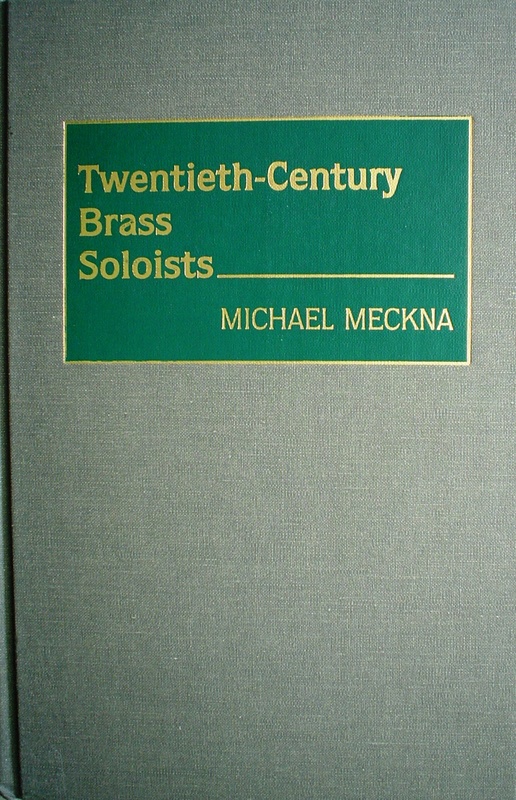 One great reference book that I have not heard a lot of horn players mention is Michael Meckna‘s Twentieth-Century Brass Soloists, which, along with lots of other treasures, can sometimes be found for a very reasonable price on Amazon. Published in 1994, the book contains short biographical sketches and discographies for 99 prominent brass soloists from the 20th century (trumpet/cornet, horn, trombone, tuba/euphonium). On pages xiii and xiv of the “Preface,” Meckna goes into more detail about the contents and purpose of his book, as well as the criteria for choosing which soloists were profiled. Each performer entry consists of three basic sections. The first is biographical and includes background, training, positions, career highlights, and awards. Then follows an analysis of technique and style as compared to distinguished forbears and contemporaries. Finally, there are a selected discography and bibliography…The performers you will read about in these pages all had to meet or exceed certain criteria. In order to narrow the field, I looked for instrumentalists who have had solo careers, recorded frequently, made unique contributions to their art, and influenced both musicians and laymen. They are the kind of artists who have toured extensively and earned international reputations. While inspiring and influential teachers and gifted orchestral players are worthy of our respect and admiration, those selected here are, as indicated by the book’s title, renowned and treasured as soloists. Twenty horn soloists are included – here’s the list. The uses for a reference book such as this are many – program notes, historical research, building a recording library, etc. – but I think what is most interesting about Twentieth-Century Brass Soloists is that it paints a picture of our shared heritage as brass players. The names listed above influenced and shaped horn playing throughout the past century, and continue to do so today. And the same can be said of the trumpet, trombone, euphonium, and tuba players included in the book as well. One comment is that in the 16 years since this book was published, the number of women brass soloists has exploded, including Gail Williams, Kristin Thelander, Marie-Luise Neunecker, and many others. Frøydis is the only woman hornist in the list above, and I would love to see another edition of this book, or something like it, which takes into account the contributions of other women brass soloists.